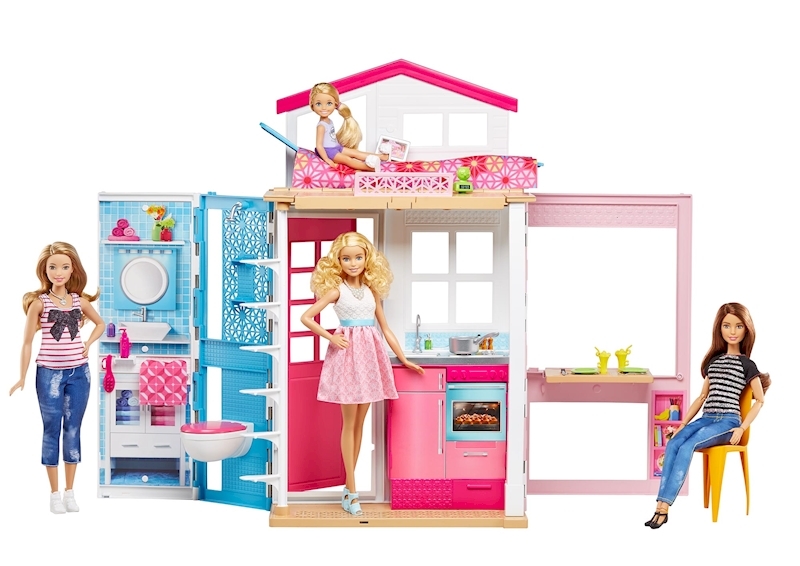 The Barbie 2-Story House is cute, modern and holds fun surprises! Designed with portability in mind, it unfolds to reveal a two-story home with multiple play spaces. Enter through the pink door. There’s a kitchen with sink and stovetop to cook up all kinds of stories. In the next space, you can leave the TV up for a living room or flip it down to create a dining table -- a sleek chair works in either setting. The colorful bathroom has a toilet and showerhead that add to play. Take the white steps to the second floor, where the bedroom does double-duty -- flip the bed over to reveal a spa! Additional pieces add to the decorating and storytelling fun throughout the house. There are place settings for two, a cooking pot, a soap bottle, a hairbrush, a tablet, a clock, a towel and a blanket. The accessories have been designed to plug into spaces on the set for creative play and easy clean up. When playtime is over, fold the house up for convenient storage or on-the-go fun -- a carrying handle makes it easy to bring along. Young imaginations will love arranging and rearranging the pieces to suit their style and the stories they want to tell because with Barbie, you can be anything! Add variety to Barbie doll’s play spaces by collecting all of her fabulous furnishings and accessories (each sold separately, subject to availability). Includes Barbie house with furniture and accessories; dolls not included. Colors and decorations may vary. Features: ? This Barbie 2-story house is cute, modern and holds fun surprises! ? Unfold the house to reveal a two-story home with multiple play spaces. ? There’s a kitchen with a sink and stovetop and a bathroom with a toilet and showerhead. ? Make a living room by leaving the TV up or create a dining room by flipping it down for a table -- a sleek chair works in either setting. ? Flip the bed over to reveal a spa on the second floor! ? Additional pieces (like place settings and a blanket) add to the decorating and storytelling fun and have been designed to plug into spaces on the house for creative play and easy clean up. ? Fold the house up for convenient storage or on-the-go fun -- a carrying handle makes it easy to bring the Barbie house along. ? Add variety to Barbie doll’s play spaces by collecting all of her fabulous furnishings and accessories (each sold separately, subject to availability).